Boris Pasternak (1890-1960) was a Soviet Russian poet, novelist, and literary translator. In Russia, his first book of poems, My Sister, Life, is considered one of the most influential collections published in the Russian language. However, outside of Russia, Pasternak is best known for his 1957 novel, Doctor Zhivago. 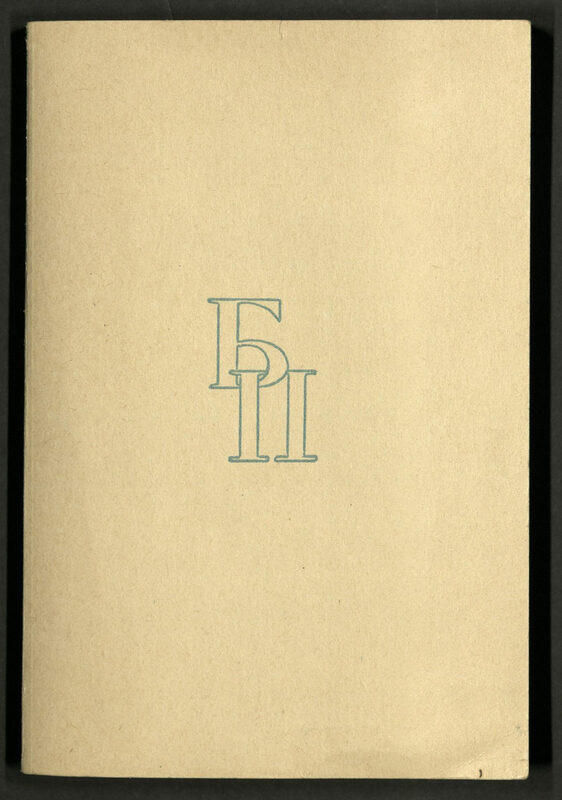 Critically depicting life between the Russian Revolution of 1905 and WWI, the manuscript was originally smuggled to Milan and published in 1957 by Giangiacomo Feltrinelli. The novel quickly rose to fame and by 1958 Pasternak was awarded the Nobel Prize for Literature. 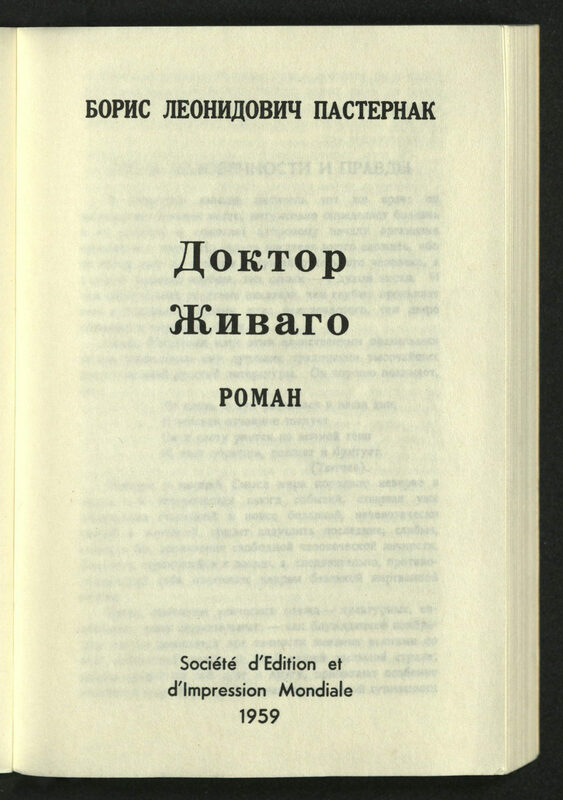 Although Pasternak was forced to decline the prize by the Soviet government, Doctor Zhivago continued to be mass-produced outside the Soviet Union and throughout the non-Communist world. 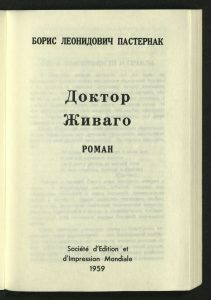 In April 2014, the United States Central Intelligence Agency released dozens of declassified documents confirming that it had covertly distributed thousands copies of the original Russian-language edition of Doctor Zhivago to Soviet tourists in Western Europe and also funded the publication of a miniature, lightweight paperback edition that could be easily mailed or concealed in a jacket pocket. 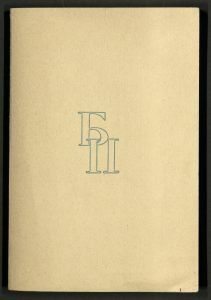 The front cover and the binding identify the book in Russian; the back of the book states that it was printed in France. 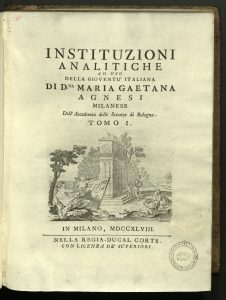 Maria Gaetana Agnesi was the eldest in a family of at least twenty-one children. Her father, Pietro Agnesi, a wealthy silk merchant, could afford to provide her with some of the best tutors available. A child prodigy, at an early age she had mastered Greek, Hebrew, French, Spanish, German and Latin. She was shy, and suffered convulsions and headaches, but had strong impetus to please her father, who was focused on moving his family from its merchant class status to aristocracy. He proudly and frequently had her present at small social gatherings in which she gave discourses in Latin on natural philosophy — subjects such as the nature of tides and the origins of spring water –, mathematics, or the nature of the soul. These discourses took place in her well-appointed family home, surrounded by lush furnishings and paintings of sacred subjects. Several of her sisters entered convents. One of her brothers became a monk. 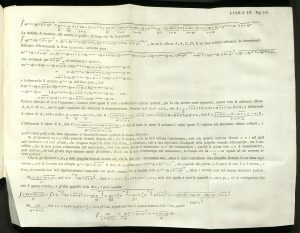 Pietro Agnesi denied Gaetana’s request to enter a convent, but eventually agreed to keep her out of the public sphere. Instituzioni Analitiche is her momumental work, which she dedicated to Empress Maria Theresa of Austria. Her objective was to give a complete comprehensible analysis of algebra, with emphasis on relatively new concepts. 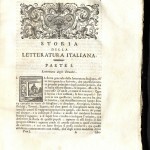 She wrote in Italian rather than Latin in an attempt to attract younger readers (in particular her brothers) and other readers, such as women, who were less than welcome in the world of Latin scholars. She explained elementary algebra, classical geometry, differential calculus, and integral calculus. Calculus was little understood by many intellectuals, including mathematicians, of the time — Isaac Newton had only recently died in 1727, Leibniz in 1716. 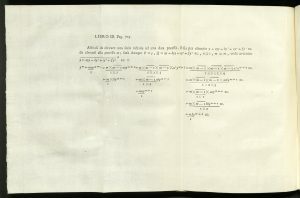 This was the first vernacular textbook on calculus. 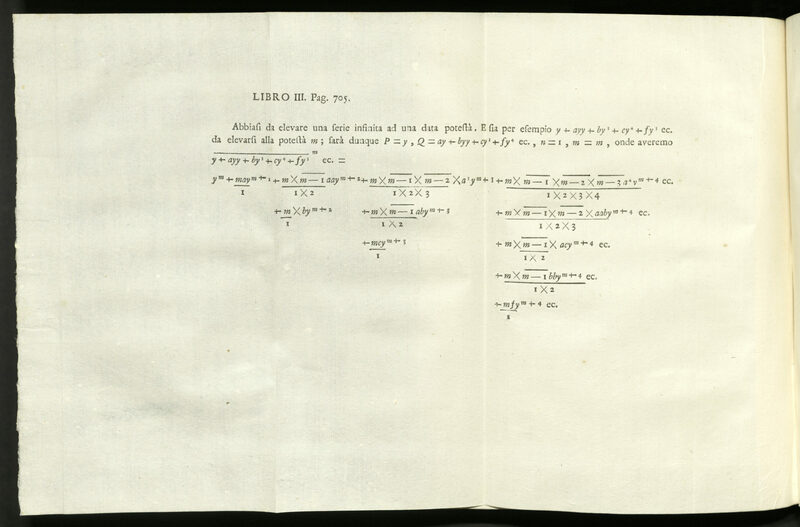 And the first mathematics book to be published by a woman. Today, Agnesi’s name is known to math students for her geometric “curve,” the witch of Agnesi, expressed as a mathematical equation. 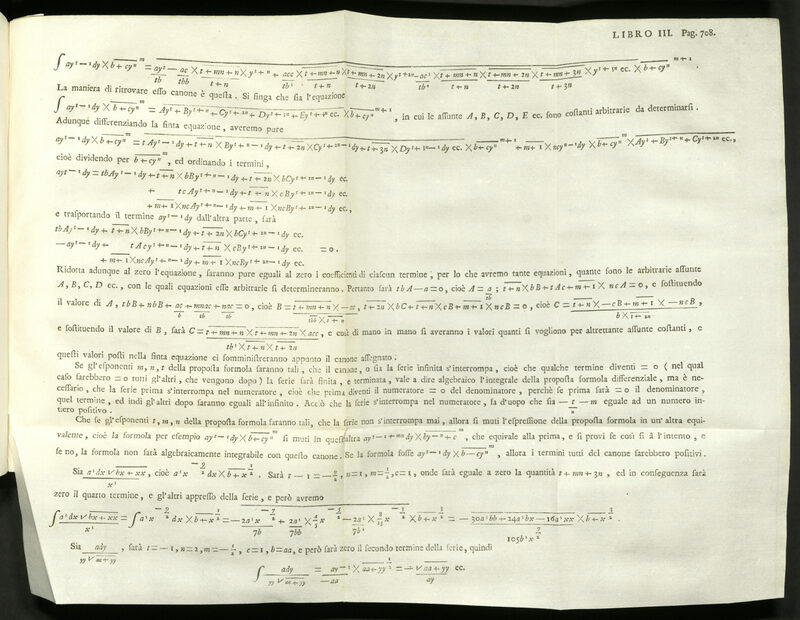 Agnesi received her greatest recognition from Pope Benedict XIV (1675-1758) in the form of two letters. The first letter (June 1749) congratulated her on the publication of her book and was accompanied by a gold wreath containing valuable stones and a gold medal. In his second letter (September 1750), the pope appointed her to the chair of mathematics and natural philosophy at Bologna. Though she accepted the position as “honorary,” she ultimately did not teach there. Following the death of her father, she no longer engaged in any scientific activity and spent the rest of her life in religious studies, devoting herself to the poor, the sick, the hungry and the homeless. She was all but forgotten for her treatise on calculus. Illustrated with fifty-nine copper engraved folding plates and two folding tables. Copper-engraved title page vignettes, headpieces and historiated initials. Rare Books copy bound in early nineteenth century calf over paste paper boards, green and red gilt-lettered spine labels. Richard-Gabriel Rummonds is recognized as one of the world’s pre-eminent handpress printers of the late twentieth century. 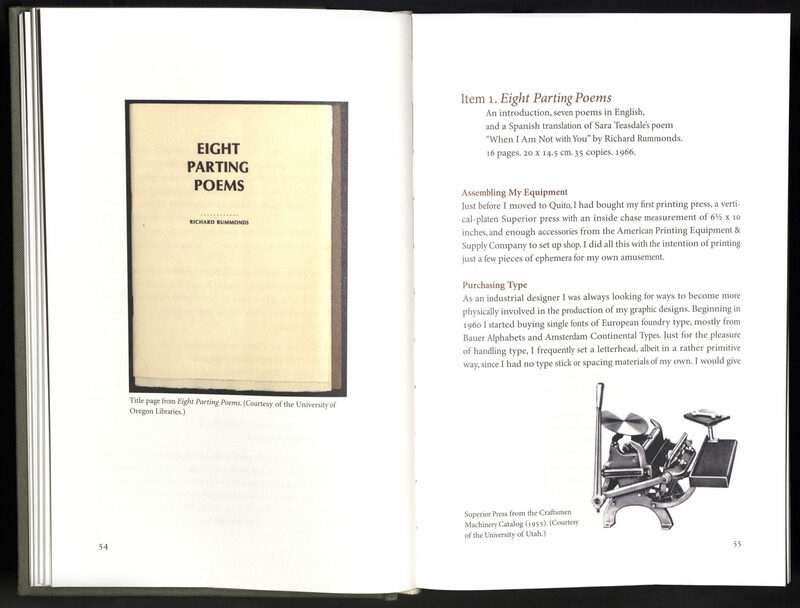 For nearly twenty-five years, using the imprints of Plain Wrapper Press and Ex Ophidia, he printed and published illustrated limited editions of contemporary literature on iron handpresses, primarily in Verona, Italy and Cottondale, Alabama. Rummonds’ work has been exhibited in Rome, New York, and San Francisco. In 1999, a retrospective exhibition of his work was held at the Biblioteca di via Senato in Milan, Italy. 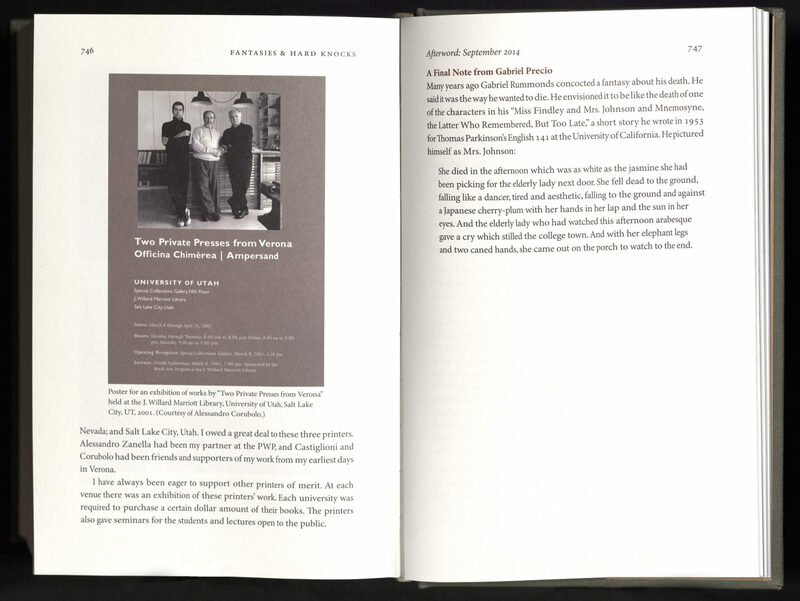 His books are held in museums, libraries and private collections worldwide. Rummonds was appointed founding director of the MFA in the Book Arts Program at the University of Alabama in 1984. He has taught workshops around the world, including the University of Utah. 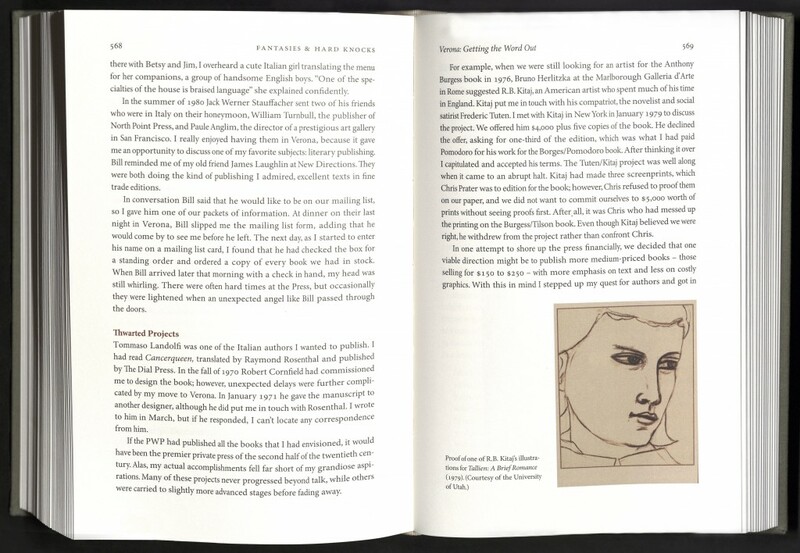 Fantasies & Hard Knocks, “embellished with over 450 images [most in color] and 65 recipes,” is a candid autobiography chronicling the printing and publishing of Rummonds’ pieces issued with Plain Wrapper Press and Ex Ophidia imprints. 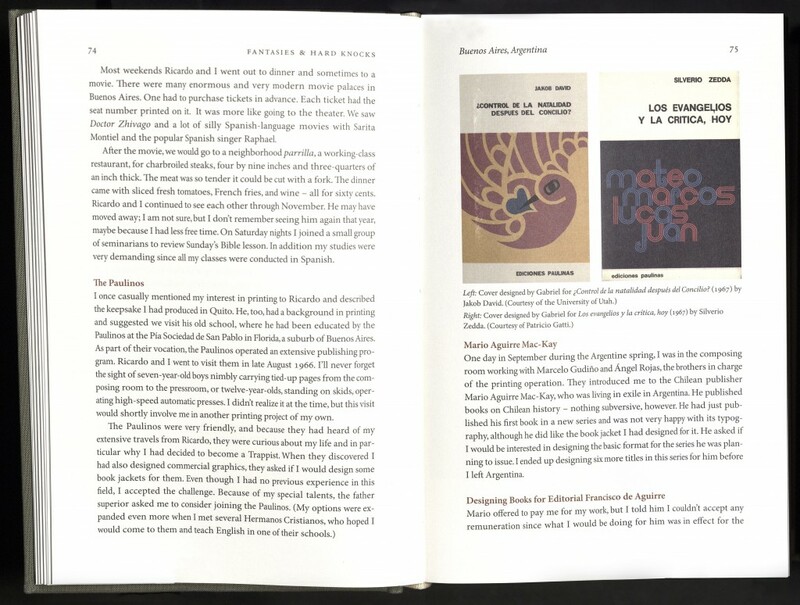 In 1966, Rummonds founded Plain Wrapper Press in Quito, Ecuador, moving it to Verona, Italy in 1970, where he mastered his craft on nineteenth-century handpresses and established a worldwide reputation for excellent fine press productions. In 1982, Rummonds established Ex Ophidia in Cottondale, Alabama. 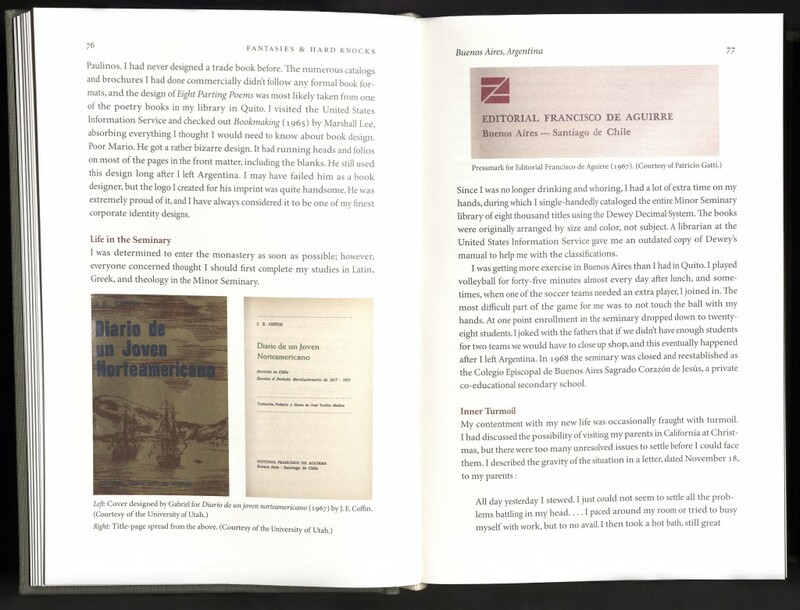 His memoir is filled with deeply personal anecdotes of working closely with many of the most acclaimed and renowned authors and artists of the time, including Jorge Luis Borges, Anthony Burgess, Italo Calvino, C. F. Cavafy, John Cheever, Brendan Gill, Dana Gioia, Jack Spicer, Paul Zweig, Arnaldo Pomodoro, Fulvio Testa, R. B. Kitaj and others. 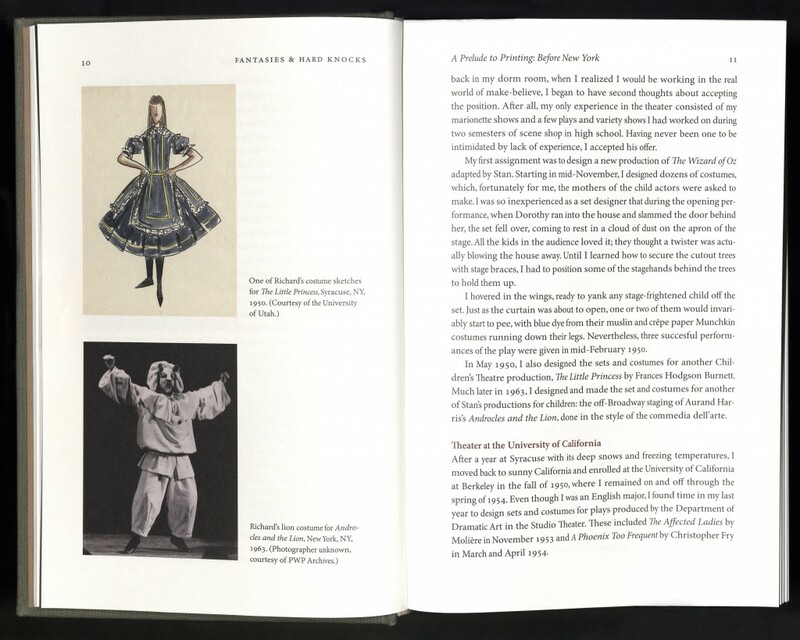 Rare Books, Special Collections, J. Willard Marriott Library holds a significant archive of the works, library, and ephemera of Richard-Gabriel Rummonds. Girolamo Tiraboschi was born in Bergamo and studied at the Jesuit college there. He entered the order and was appointed professor of rhetoric and belles-lettres at Brera in Milan in 1755. In 1770 he became librarian to Francis III, Duke of Modena, at the Biblioteca Estense. 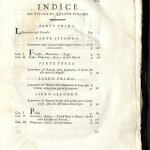 There he collected material for his monumental Storia, the first significant history of Italian literature, first published from 1772 to 1782. 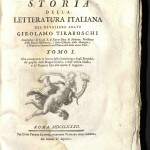 A comprehensive work, extending from Etruscan times to 1700, Tiraboschi addressed literature in its broadest sense, including history, philosophy, fine arts, medicine, and jurisprudence. Beautifully written in a clear style, the entire work is heavily documented from sources in the Biblioteca Estense. Tiraboschi was inspired to defend Italian arts against the attacks of foreign critics, an early attempt at unifying the Italian political states through cultural bonds. Bound as issued in publisher’s flexible boards. Anonymous gift. Thank you, Anonymous!